Use the term import wizard to import a terminology file in CSV, ACTIF, OLIF or any custom XML-based terminology exchange format. Setting your initial import options. Mapping columns or elements in your source data to fields in the Terminology Manager. Mapping values in your source data to list items in existing list fields in the Terminology Manager. Tip: If you are importing terminology into a database which already contains terms, you may want to configure your duplicate detection rules first. If you have images that you want to display in your term entry details, you must include links to your image files when preparing your terminology data for import. You can link to image files that you have copied to your Acrolinx configuration directory, or images that are hosted on a web server. Copy your image files to the uploaded images directory in the Acrolinx Server configuration directory. Copy your image files to a web server that all users can access. Ensure that your import file references the images correctly. The Terminology Manager resolves the image location relative uploaded images directory. If you store your images on a web server, the import file must include the full image URLs as illustrated in the following example. Start the term import wizard. If you want to start an import with the same settings as a previous import and have saved those settings in an import configuration, you can skip the following procedure. Instead, select your saved configuration in the Saved Import Configurations table, choose your import file and click Next . Restriction: You cannot use saved import configurations if you regularly import terms from CSV files and the following condition applies to your terms: Your terms are assigned to several values of the same custom list field at the same time and the assignments are separated by a semicolon or a colon. For example, your CSV file might contain the term "example" which is assigned to the custom list values "1;2;3" of the custom list field "Priority". If this condition applies, you must manually perform the import procedure and field mapping. ACTIF to import a file in the native Acrolinx terminology exchange format. Custom to import any XML-based format used by other terminology management solutions. CSV to import a delimited text or CSV file. CSV (Translations only) to import a CSV file which contains new translations for source terms that already exist in the terminology database. OLIF to import an OLIF file. (Follow this step if you selected the Custom format option) Select a Transformation option from the Transformation dropdown in the Format-specific Options . (Follow this step if you selected the Custom format option) Select the domain list delimiter in the Format-specific Options if you import terms with multiple domains. (Follow this step if you selected the CSV format option) Open the Format-specific Options to configure the advanced CSV options . Tip: The default value delimiter for CSV files is a comma. In most cases you do not have to change the advanced CSV options. The default CSV options are sufficient to import most CSV files. Check the advanced CSV options if your CSV file is tab delimited, or contains special characters or metadata. When you import terms from another terminology management system into the Terminology Manager, your data may be organized into fields which are different to the fields used in the Terminology Manager. To import your data correctly, you must indicate which column or element in the import file matches a corresponding field in Terminology Manager. This process is called mapping. The field mapping page enables you to configure how the term import wizard matches your source data to fields in the Terminology Manager. Source Data section Select and map columns or elements from your import file. Show Mapped Columns/Elements button Show or hide columns and elements that you have already mapped in the source data section . By default, mapped columns and elements are displayed in gray formatting. Mapping buttons Map a selected column or element to a corresponding field ( Mapping Term Columns , Mapping Identifier Fields , Mapping Descriptive Information ). 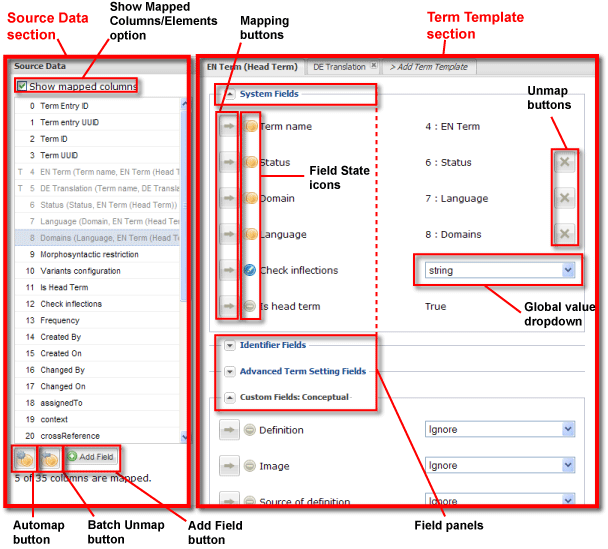 Term Template section Add new term templates ( Mapping Term Columns , Mapping Identifier Fields , Mapping Descriptive Information ) and manage mapping and global values for fields within term templates. Unmap buttons ?? Unmap columns or elements from fields . Field State icons Indicate the current state of completion for a particular field. A field can either be mapped to your source data or have a global value . Global value dropdown Set a global value for a field . Automap button Automatically map a selected column or element to a field on a term template with a similar name . Batch Unmap button Unmap a selection of columns or elements with one click . Add Field button Create a new field for a column or element in your source data . Field Panels Show or hide a group of fields on a term template. The term template section always contains at least one term template. A term template contains all of the fields which store information about a term in the Terminology Manager. You use a term template to define how the term import wizard should populate the values for each of the fields. You can create additional term templates if you have a CSV which contains more than one term column. Additional term templates enable you to define different field settings according to the types for terms you have in each column. The fields on a term template are grouped into collapsible panels based on the type of information that they store. System Fields Fields that are compulsory for a term. Administrative Fields Fields that contain information about the edit history of a term. This panel is only available when importing ACTIF files or when using an ACTIF custom XML transformation. Custom Fields: Conceptual Custom fields that contain information relating to an entire concept. Custom Fields: Term-specific Custom fields that contain information that is specific to an individual term. The procedure for mapping your source data is influenced by the file format you import, and can consist of three major steps. This step is not necessary when you import in an XML format such as OLIF or ACTIF . For XML-based file types, the term import wizard automatically maps the element which contains the term names to the 'Term name' field. Due to flexibility in CSV file structure, this type of automatic mapping is not possible with a CSV file. When you import a CSV file, the term import wizard requires you to map your term columns first. If you are importing new term entries and want to retain identifier information from another system, you can map the relevant columns or elements to the identifier fields. Additionally, if you intend to overwrite existing terms or update existing term entries it is advisable to map at least one of the term identifier fields. When you import a file with the format CSV (Translation only) you are required map at least one of the term entry identifier fields first. This behavior ensures that new translations are imported into the correct term entries. If you do not have identifiers in your import file, the term import wizard generates identifiers for you. Descriptive information can be any column or element which does not contain terms or term identifiers, such as definitions or workflow-related information. When you import an ACTIV , OLIF or Other XML file, many standard descriptive elements are mapped automatically, although you may have custom elements which you must map manually. When you import a CSV file, you must map all descriptive information manually. After you map a column or element in the source data section, the name of column or element is displayed in gray. In the illustrated example, the column 'Usage Status' is mapped to the system field 'Status' on the term template for product names. Tip: You can also deselect the option Show Mapped Columns or Show Mapped Elements if you prefer that columns or element names disappear from the source data section after you map them. Follow this step if you are importing a standard CSV file. If you are importing a file with the format CSV (translations only) go to step 2. Select the column name in the source data section which contains your terms (if your CSV file stores terms in more than one column, select the column that contains your head terms). 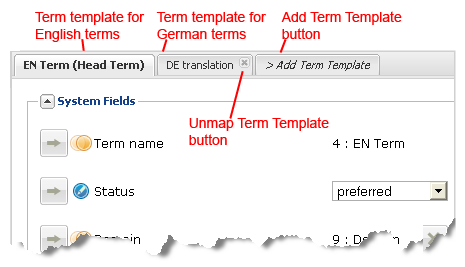 In the term template section , click the mapping button next to the field 'Term name'. Follow this step if you are importing a CSV file which stores terms in more than one column. Select a column name in the source data section which contains additional terms such as suggestions or translations. In the term template section , click the Add Term Template tab at the top of the term template section . A new term template tab appears which is named after the column you selected in the source data section. 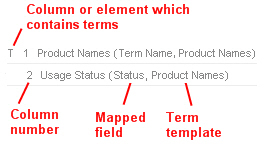 The selected column or element is automatically mapped to the field 'Term Name' on the new term template. Repeat step 1 until there are term templates for all columns that store terms. Tip: You can make the mapping process faster by double-clicking a column name which contains terms. If the column name contains the word 'term', the column is automatically mapped to the field 'Term Name'. If the column name contains the name of a status or language which is recognized by the Terminology Manager, a new term template is created for the column. You can also automap a group of columns or elements by selecting the relevant columns or elements, and repeatedly clicking the automap button. If you still have unmapped columns, click the first tab in the term template section to return to the head term template and continue to step 3. If you have no more unmapped columns, review the fields on each term template and set global values for any unmapped fields . The Terminology Manager provides two types of identifiers for term entries and individual terms. Custom Identifier Retain identifiers generated by another system. You can also edit custom identifiers in the Terminology Manager interface. If you do not have your own identifiers a 13-digit number is automatically generated and stored in this field. Universally Unique Identifier Generate and store a Universally Unique Identifier (UUID) for term entries and individual terms. You can use Universally Unique Identifiers to ensure that your terminology identifiers remain unique when transferring terms between different installations. Important: The Terminology Manager requires all term entries and terms to have a UUID. If your terms do not have UUIDs, the Terminology Manager generates one for you when a term is created. Select a column or element name in the source data section which contains your identifiers. In the term template section , click the mapping button next to one or more of the identifier fields in the Identifier Fields panel . Important: If you are importing a file with the format CSV (translations only) you are required to map a column to the Term Entry ID or Term Entry UUID before mapping any other source data. Select an unmapped column or element name in your source data and click the mapping button next to the corresponding field on the relevant term template . Repeat step 1 until you have mapped all of the columns in your source data that have corresponding fields in the Terminology Manager. Tip: You can make the mapping process faster by double-clicking a column name. If the column name is close enough to the name of an existing field, the matching field lights up green in the term template section and the column is mapped to the matching field. You can also automap a group of columns or elements by selecting the relevant columns or elements, and repeatedly clicking the automap button. You can also double-click a field name in the term template section to select the mapped column or element in the source data section . Follow this step if you have unmapped columns or elements which have no corresponding field in the Terminology Manager. Select an unmapped column and click the Add Field button. You can find the Add Field button at the bottom of the source data section . Term-specific to save the information that applies to individual terms. Conceptual to save the information from that applies to all terms for the same concept. Example: A definition or an image can be the same for all terms in a term entry and is often stored in a conceptual field. Text to create the column or element as a free text field which can accept any value. In the text field which appears, enter the display name for the field. Single-choice list to create a dropdown field that allows users to select one value from a list of items defined in a category. The data in your column or element cannot contain more than 255 distinct values. In the text fields which appear, enter the display name for the field and the name of the category where the list items should be stored. For example: You're importing data that includes a fixed range of product types and a term can belong to one product type only. You don't have a list of product types yet, so you want to create one based on your import data. Single-choice list (populated) to create the column as a new dropdown field which accepts a fixed range of values, but use an existing list and map your import data to this list. For example: You're importing data that includes a fixed range of product types and a term can belong to one product type only. You already have a list of product types in the category manager so you want to create a new field that uses this list. You'll also map your imported product types to this list. In the second dropdown that appears, select the appropriate category. Multiple-choice list to create a list box that allows users to select several values from a list of items defined in a category. For example: You're importing data that includes a range of products and a term can belong to several products. You don't have a list of products yet, so you want to create one based on your import data. Multiple-choice list (populated) to create a list box that allows users to select several values from a list of items defined in a category. Use an existing list and map your import data to this list. For example: You're importing data that includes a range of products and a term can belong to several products. You already have a list of products in the category manager so you want to create a new field that uses this list. you'll also map your imported product names to this list. New fields appear in italics at the bottom of the term level, and term entry level custom field panels . You can use the Remove buttons to remove any fields which you created in error. Review the fields on each term template and set global values for any unmapped fields . After you have finished mapping columns or elements in the source data section , review the field states on the term template section to see if any further action is required to import your file. Incomplete The field is a system field, is unmapped, and does not have a global value. Mapped The field is mapped to a column or element in your source data. Ignored The field will be ignored during the import. Tip: All custom fields are set to 'ignored' by default. Global Value The field has a global value defined. Same as head term The instance of the field uses whatever value is defined for the field on the head term template. This state only applies to an instance of a field on an additional term template. Example: If 'status' is set to 'proposed' on the head term template, you can configure the German term template to use the same status value as the head term template. If you change the status to 'preferred' on the head term template, the status for German terms will be automatically updated to 'preferred' as well. Tip: All system fields on additional term templates are set to this state by default. Locate any fields which are marked with an Incomplete icon. Select a global value from the global value dropdown . After you select a global value, the field state icon is updated to Global Value . Follow this step to set a global value for a field which is currently in a mapped state. Click the Unmap button next to the field, or select several columns in the source data section and click the Batch Unmap button. The global value dropdown reappears for the fields you have just unmapped. Click Next to move to the List Item Mapping page . You use the List Item Mapping page to map unidentified values for existing fields or review the saved mapping settings. For example, you might update the list item mapping if your import file contains a domain name that your terminology database does not recognize. You can map the unidentified domain to an existing domain, or add the new domain to your terminology database. Unidentified values are indicated with a red exclamation mark icon . Map each unidentified value to an existing list item. Create the value as a new list item within an existing category. Create as new list item to add the value as a new list item. In the confirmation window which appears, click the radio button next to the category to create a top-level list item or click a list item to create a sub-list item. To enter a new name for the list item, click rename then ok to confirm. Map to existing list item to permanently map the value to an existing list item. In the confirmation window which appears, click the radio button next to the list item which is the closest match for the unidentified value. If you want a certain mapping to be removed from your saved import configuration, you can also select Remove mapping and save the configuration. (Optional) To automatically map all unidentified values in a category to existing list items, click Map It For Me . You can use the Map It For Me function to map values that are slightly different to the names of existing list items in their case or spelling. For example, the Map It For Me function could map the value 'feminin' to the existing list item 'feminine' where a misspelling has caused the value to be unidentified. If the Map It For Me function cannot find a match, it creates a new list item. This function is also useful for creating all values as new list items with one click. Tip: When matching a list item name, the Map It For Me function checks the standard name first, followed by the display name. (Optional) If you need to interrupt the import at this step, click Save Import Configuration to save the settings you have changed so far. Click Finish to move on to the Import Summary Page . Important: The Finish button stays inactive until you resolve all unidentified values and confirm any unsaved rename fields. When you have completed the term import wizard, the Import Summary page displays the number of terms which will be imported into the Terminology Manager. The import begins and a progress bar displays underneath the Navigation Menu until the import operation completes. You can continue to use the Terminology Manager while the import is running. After the progress bar completes, you can view a log of the import operation. For more information see the topic Viewing Import Log Messages . Click Save Import Configuration . Enter a name for a new import configuration in the first text field. To overwrite an existing import configuration, use the radio buttons to select a name in the Saved Import Configurations table. Click Start New Import . The Dashboard features a generic inbox for viewing log messages for any tasks that run in the background. This inbox is located at the top right of your screen in the Dashboard Menu . Large import tasks run in the background while you continue to use the Dashboard . When the import is complete, an unread envelope icon displays next to the Messages menu item in the Dashboard Menu which indicates that you have a new import log message. Click the Messages menu item in the Dashboard Menu . In the Messages Window , click an unread message. The Log Message Window opens and a summary of the import is displayed in a text box. Click Download Detailed Import Log at the bottom of the Log Message Window to download a complete log of the import. Tip: All import log messages are removed from the Messages Window when the Acrolinx core server is restarted. However, the detailed log files are still stored in the server output directory. For more details ask your Acrolinx Server administrator.